A stuffy nose and a sore throat: it’s that telltale combination of symptoms that usually indicates the start of a cold or flu. Not surprisingly, these symptoms often exist alongside one another, like mac and cheese. Or bubbles and baths. The stuffy feeling you experience when you’re sick is a result of your immune response, which produces mucus as a way of flushing out whatever is causing the irritation– in this case, a cold or flu virus. In addition to causing sinus headaches, drainage of mucus from the sinuses down the back of the throat (otherwise known as ‘post-nasal drip’) can cause a sore throat. That’s how a cold or flu virus often works – one symptom leads to another which leads to another, creating a host of different ailments. And that’s why a multi-symptom OTC remedy like Contac® Cold + Flu is so effective. The unique combination of a decongestant and a pain-reliever in Contac® Cold + Flu can effectively control your nasal congestion and sore throat in a single dose. 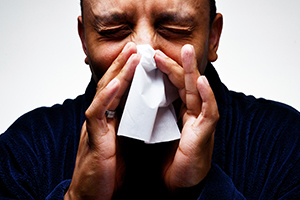 What causes nasal congestion and sore throat? Nasal congestion is the result of the overproduction of mucus. This often causes post-nasal drip which in turn leads to sore throats. In fact, most sore throats are caused by a cold virus and the post-nasal drip is caused by body’s reaction to the virus. Drinking plenty of water and/or warm liquids. Using a humidifier or vaporizer or carefully breathing in steam from a pot on the stove. Avoiding spicy or rough-textured foods which can irritate the throat. Using warm compresses on your face to relieve discomfort and open your nasal passages. Keeping your head elevated while sleeping to facilitate draining and make breathing more comfortable. Avoiding cigarette smoke and odors. The next time you feel the familiar combination of a sore throat and stuffy nose, reach for Contac® Cold + Flu. We’ve got your most annoying cold symptoms covered. Desert Pediatrics. (2007). Sore Throat. [PDF File]. Retrieved August 15 2012, from http://www.desertpediatricslv.com/pdfs/medical_library/SoreThroat.pdf.